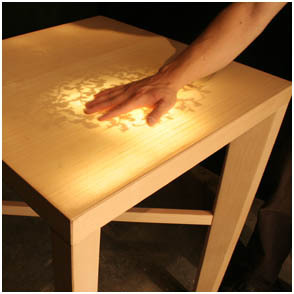 What at first appears to be a solid wooden surface comes to life when touched. An exploration of modernism and ornament in design, this furniture conceals its true identity until interacted with. Shadows evoke a Victorian lace doily on the table. The hidden ornamental elements further conceal imagery related to the fabrication of the furniture: a hammer, a logging truck, electrical cord, airplane, and various forest animals can be found, as well as other symbols. Just as the sparse, modern photos in architectural magazines belie the true nature of lived-in spaces, these furnishings crave the human touch and come to life with warmth and poetry in response. Concept and design: Gorbet Design, Inc.